Madame means mischief in this series of slice-of-life vignettes that present the private love, laughter and frustrations of a pet who thinks she’s an owner! Whether she’s tearing up clothes, spilling ink on the carpet or filling the air with stinky tuna-breath, Madame is both wonderfully frustrating and endearingly whimsical. With narrative mastery, Nancy Peña brings us small, hilarious sketches that appeal to cat lovers of all ages! 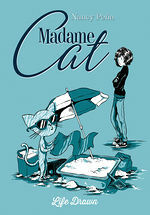 "Any cat lover will instantly gravitate towards and identify with Madame Cat." "With narrative mastery, creator Nancy Peña has created something truly delightful and effervescent that will appeal to cat lovers of all ages. " "This is one that will appeal to both cat fans and fans of slice-of-life comedy strips. Nancy Peña is definitely a name to watch." Mixing humor and poetry, this duotone collection tells the tale of the relationship between Madame Cat and Nancy Pena. These short and whimsical slice-of-life stories are embellished by the cat’s profound musings. With each little gag always spot-on and subtly written dialogue, it's brimming with ironic poetry, affectionate satire, and scathing, biting humor.